For some reason pigs seem to make for some interesting interpretations into slots. 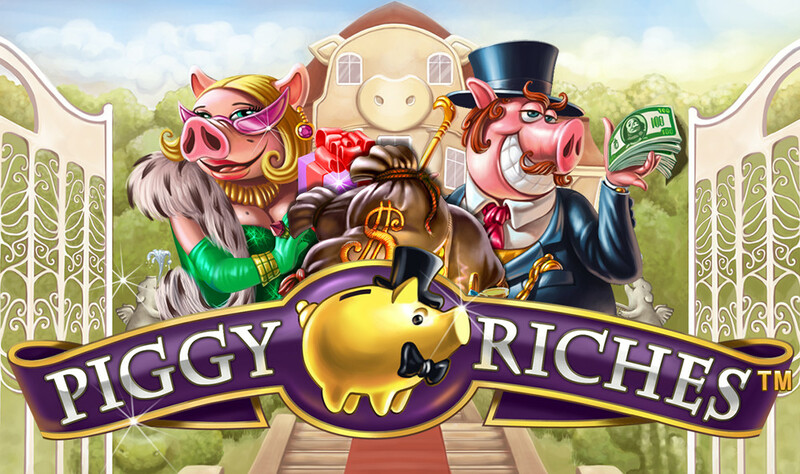 Piggy Riches is one such slot and hails from the NetEnt library, so join us as we enter the rich and wealthy world of the lord and lady of pig manor! Lord and Lady pig have opened the gates to their home and are allowing you to play your game in front of their lavish mansion, come on in and mind your step. 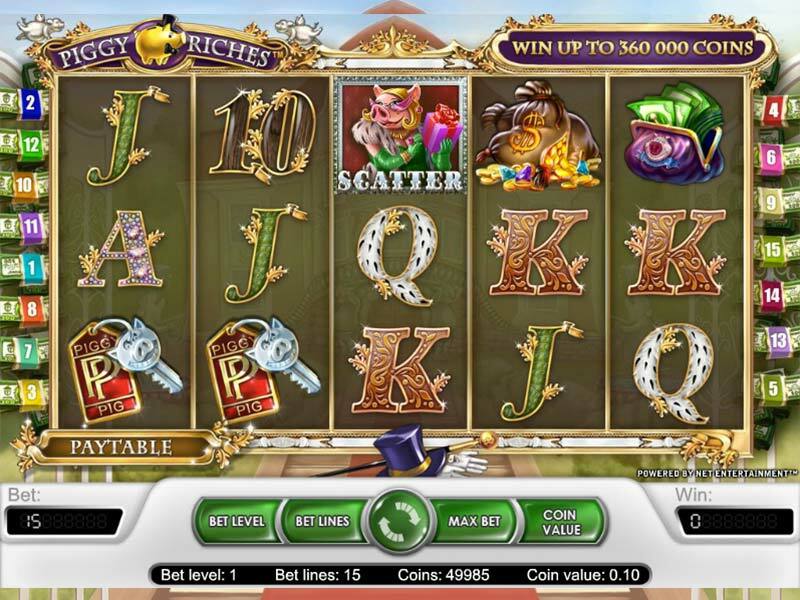 Piggy Riches is a 5-reel, 15 fixed pay line slot, which offers an RTP of 96.4% to players. The whole game exudes luxury with wads of notes at the end of the reels, which themselves are edged in gold! As you would expect from a game of such lavish design, the higher value symbols are shown by way of bags of gold, golden credit cards, a silver car key, a purse full of cash and a piggy bank stuffed with notes. Even the lower value symbols have been given the rich treatment, the A, K, Q, J and the 10 are all gilt edged with gold and have golden filigree designs over the top. Wherever you look in Piggy Riches you are surrounded by wealth, so let’s hope it is a good sign and brings you luck. Bet Amounts – Betting on Piggy Riches begins at 15p per spin and can be increased to £30 per spin, so despite its looks Piggy Riches is more affordable than you would think. Amend those bets by changing the coin level or the coin value until you reach your desired stake amount. Wild Symbol – Lord pig is your wild symbol, or more specifically it is his character gloating about the wad of cash in his hand. He will substitute for all other symbols except the scatter and he throws his cash up in the air when he forms part of a win, which is a fun addition to the game. Scatter Symbol – Lady pig is your scatter and she is symbolised holding onto her many gifts that Lord pig obviously bought for her. Land three or more of these symbols to trigger the bonus spins round. Scatter wins are also in play here, so to win an extra cash sum on top of your line win you just need to have x2 or more scatter symbols present. She will also caress her gift when she forms part of a win, it looks a bit odd if we are honest, but she obviously loves her gifts! Treasure Jackpot Feature – Piggy Riches offers a jackpot treasure trove to aim for. Its simple enough in that you just need to land x5 of the bags of jewels and cash symbols, aka the treasure. It may take some time to do this but when you do, you will be awarded a win of x2,000 coins for your trouble. Piggy Wild Feature – Land a winning combination completed with the Lord Pig wild symbol, then you are in for a treat to the sum of x3 your win amount. This feature is active in both the base game and the bonus spins round too, meaning more chances to win. It is a nice little multiplier in a game when features are few and far between. Bonus Spins Feature – Having landed three or more Lady pig scatter symbols on the reels you will enter the bonus spins round. Here you will be given a choice of symbols to choose from. Each symbol will have a different amount of spins and a random multiplier added to it. Spins will range from 5 to 28 as a maximum, with multipliers ranging from x2 to x6. You will usually see the higher spin totals having a lower multiplier and the lower spins having a higher multiplier! Monocles at the ready people, for Piggy Riches is going to introduce you to the luxurious lifestyle that we all dream of. You may be closer to it than you think, if you hit the big wins. NetEnt have let themselves down somewhat with this game as there is so much work gone in to the design and graphics, we expected a little something more with the features. That being said it is still a really easy game to play along with and indeed enjoy, although you may want to switch off the sounds after a while those random ‘oinks’ can get a tad annoying.